Too many homeowners do not give enough thought to the quality of the air they breathe on a daily basis. 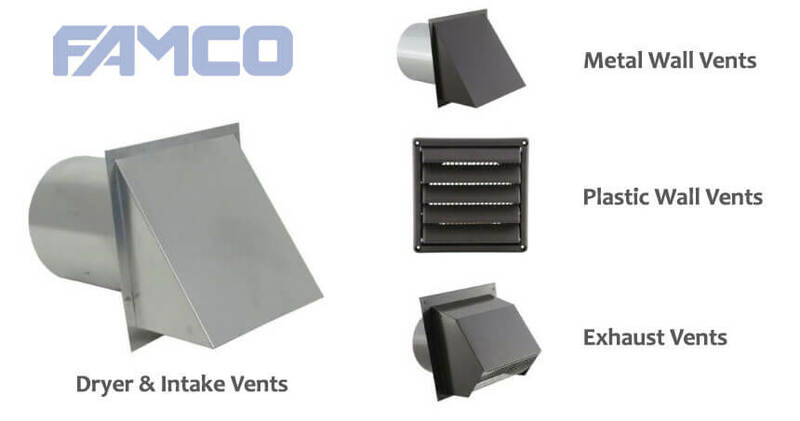 If you are looking to improve the air quality in your home or office, start with FAMCO, home to top quality wall vents for air intake and exhaust applications. Wall vents will help bring in air from the outside and improve the natural ventilation within the spaces of your home. As a proud manufacturer of wall vents and caps to customers throughout the world, FAMCO can help you find wall vents that will prevent the growth of mold in your air filtration system, which is especially important in rooms that experience increased moisture and humidity, like the kitchen, bathroom, attic, and laundry room. If you live in a part of the world that experiences especially cold weather, wall vents are especially important given that the area where you live is prone to create a condensation problem. It doesn’t take long for you to find condensation forming along your windows and walls especially during the winter months. Electric heaters and dehumidifiers promise relief but often times fall short of solving the problem. Investing in quality wall vents for quality air intake is important and a decision that will likely impact your health. FAMCO offers a large selection of wall vents with a wood and metal finish, available in different colors to match the color scheme in the various rooms of your home. Many customers come to us unsure of what exactly they need in their home, which is when our team of professionally trained staff becomes especially useful. We are headquartered in Meridian, Idaho yet serve customers throughout the world. Vents are available in a variety of sizes, in different materials and colors, providing the ultimate in optionality for our customers. Installation is easy and most customers find that they can install their wall vents themselves. Besides the high quality and smooth customer experience, one of the reasons why FAMCO customers stay local is that our products remain covered under warranty. As one of the largest manufacturers of ventilation products in the Pacific Northwest, we can help you find wall vents that will ensure the cleanest and most quality air for you.